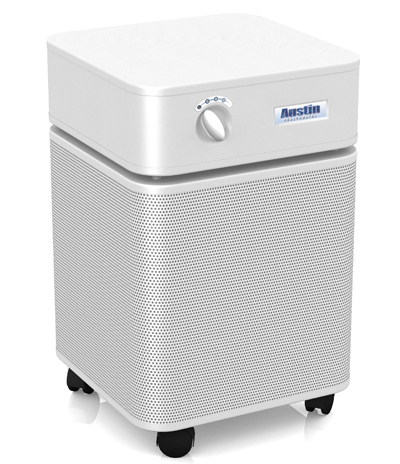 The Austin Air Healthmate Air Purifier B400C1 cleaners have been constantly rated at the top of air cleaners categories in independent testing. The Austin Air Healthmate 400 cleans up with 15 lbs. of Carbon-Zeolite mix and true medical HEPA filter media adsorption of odors and gases. Comes with wheels for easy portability. Order the compact yet effective Austin Air Healthmate 400 today. 1. Specialty air cleaner with 60 sq. ft. of medical HEPA, certified to remove 99.97% of airborne particles 0.3 microns or larger. 2. Contains 15 pounds of granular carbon and zeolite for the adsorption of odors, gasses and chemicals. 3. Stands 23" tall and 14.5" wide. Effectively cleans an area of 1500 sq. ft. (with normal ceiling heights). *See Owner's Manual for details. USE COUPON CODE "PURE15" TO SAVE 15%!!!! Replacement Filter for the Austin Air Healthmate Junior Air Purifier. Replacement Filter for the Austin Air HealthMate Air Purifier. Purchase an Austin Air HealthMate filter online today and enjoy free shipping on your order.